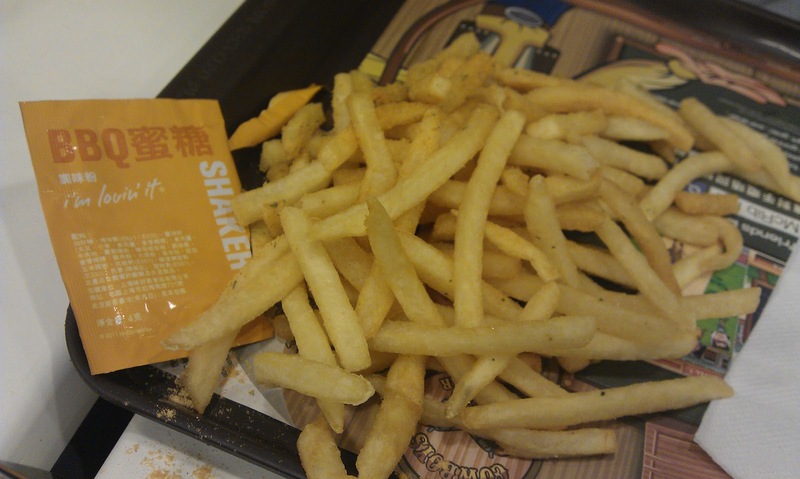 I thought I would review the Honey BBQ Shake Shake fries today because I was looking over the HK McDonald's homepage, and I saw that they have reintroduced the Seaweed Shake Shake Fries. It seems like Seaweed is the most popular variant, as it seems to pop up ever 6 months, I even had it back in 2010, but only reviewed it a few months back! This was just one of the few items I tried last November, and you can find my previous review of the Mango Chicken Panini & Mango Hazelnut Cheesecake here!. Though I originally tried it back in November, I was able to grab an extra packet, and my girlfriend and I tried it in Seoul, about 6 months later (slightly after the best before date), so I will be basing this review on a May 2012 tasting. If you haven't read my previous Shaker reviews, what you are supposed to do is dump your fries and the seasoning into a bag and shake them up together. Both times I tried this with the Honey BBQ I never could get an even coating of seasoning, whereas in Hong Kong, we used an entire packet for an medium fries, my girlfriend in Seoul was hesitant, and only let me season half a medium, so I only used half the packet. Both times, the fries which the seasoning was poured on directly, had clumps of seasoning stuck to them, and the rest barely received any. This never happened with other seasoning, (or the Shaka Shaka Chicken in Japan), so maybe it was due to the ingredients of the Honey BBQ which caused it to stick. Here's an OpenRice.com photo and you can see its even clumpy inside the packet. It was salty (as is expected), but it didn't taste like Honey BBQ flavouring at all. It was slightly sweet, but neither spicy, nor any noticeable Honey or BBQ flavourings. My girlfriend took one fry and wouldn't eat the rest, as she claimed it was all MSG (which undoubtedly it was), but I was able to enjoy them enough to eat a couple more. Though, it wasn't good enough to bother finishing, I guess she was right, not to waste the entire fry.